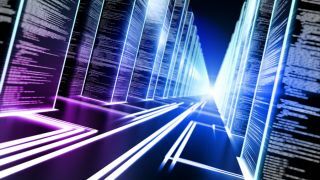 Fujitsu has developed a new software technology that can perform data searches as fast as 40Gb/s –– an important step forward in managing an ever-increasing volume of information. The Fujitsu technology can perform high-speed capture, accumulation and searches at super-fast speeds, thanks to a combination of servers for scalable disk capacity and parallel-input performance, with a stream-analysis unit for sequential processing. As data packets are captured, they are automatically sorted based on search criteria, substantially increasing the pace of searches. The technique eliminates exclusive access control locks, increases disk read/output performance, and avoids unnecessary copying of data. The result is that huge amounts of information can be accumulated and searched, over a period of many hours, at speeds of up to 40Gb/s. Previous approaches to data searches required specialized network analysis hardware, but Fujitsu's new software-based approach requires only conventional hardware. With companies expected to face a Big Data crisis by 2017, according to Gartner Research, technologies like this one will have a lucrative customer base. Fujitsu hopes to launch the technology in its fiscal year 2014. How important is Big Data?